These flourless Chocolate Brownie Cookies are incredibly fudgy and super chocolatey – they’re like a brownie in cookie form! These cookies are naturally gluten-free. March 2016 Update: This recipe is old favorite that was originally posted on December 31st, 2013. I updated the photos in March 2016 to show off just how beautiful and fudgy these cookies are. For memories’ sake, the text and recipe is left the same as when it was originally posted back in the day…so I’ve already (unfortunately) finished my time studying abroad. Enjoy! It’s the final day of the year, and I’m waking up in London! It’s the first days of my semester abroad, living in a new city. I arrived yesterday with my best friend Paige around 2pm. We took a taxi to the hotel, and set off to explore a little bit. We got our new British phones and some toiletries, albeit only after a long while wandering around Oxford Circus and going in way too many phone stores, ate dinner, and proceeded to pass out for 15 hours. Guess we needed a little bit of sleep!We’re still drowsy/jet-lagged, but also so ready for an amazing New Years Eve in London! This is going to be a short post, 1) because our Internet is almost expired, and 2) we really need to get out of bed and go run some more errands in our new city. But these cookies though, I couldn’t not share them with you guys. 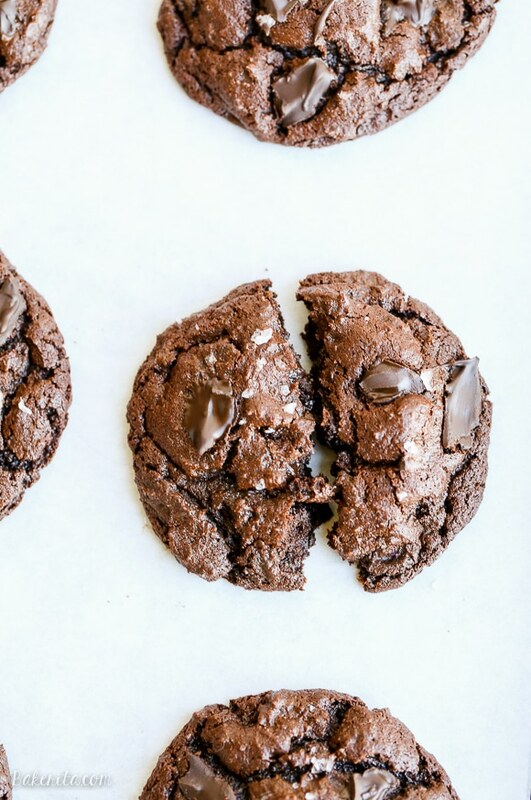 These cookies are rich, decadent, and sooooo chocolatey. These are a cookie that you would have no idea are gluten-free, and honestly, flour in these would just tone down the chocolatey-ness which simply would not do. These are brownie cookies to the core with their deliciously rich fudge center, and I know they’re a recipe I’ll be making again and again. It’s also incredibly nice that they come together so easily! You could use a mixer if you wanted, but why both with the extra dishes? I used a wooden spoon and a bowl and they came together perfectly – just make sure to mix together your butter and sugar fully before moving on with the recipe. I also like using chocolate chunks in these cookies. The big chunks get super melty and stay melty in the middle of these cookies, resulting in some seriously bold chocolate flavor that will satisfy even the biggest of chocoholics. Also…definitely don’t over-bake these guys! If anything, err on the side of under-baking. You want these to be ooey-gooey. The final touch to make these outstanding? A sprinkle of flaky sea salt! The salt is the perfect complement to help balance out the slight sweetness and bittersweet chocolate. It takes these already-bomb cookies to the next level. Enjoy! Thoroughly mix together the butter and sugars until completely combined. Add the egg and vanilla and stir until combined. Add in the baking soda, salt, and cocoa powder and mix until smooth. Stir in the chocolate chunks. Use a cookie scoop to shape cookie dough balls. Sprinkle with flaky sea salt, if desired. If you want thick cookies, place dough in the freezer for 15 minutes before baking. You can also place the cookie dough in the fridge for up to 3 days before baking. Bake for about 10 minutes or until set around the edges but still gooey in the center. Let cool for 15 minutes on the baking sheet before transferring to a cooling rack to cool completely. So exciting that you are celebrating New Years in London! Have a wonderful trip, Rachel. And you know I could never turn down a chocolate brownie cookie! These cookies look fantastic! I can’t wait to try them! Thanks for sharing. Rachel these cookies look sooo delicious! I love the fact that they are gluten free! Have a happy new year!! They look delicious, I printed your recipe and plan to try them soon, thank you. Chocolate is always a nice little treat! I want to work more with chocolate after seeing this! oooh I hope you had a great New Year’s in London!! so fun!!! These cookies look so fudgy and delish! I hope you had the most awesome of NYE’s in London! Happy New Year Rachel! These look fantastically rich and decadent! Have a fun time in London! 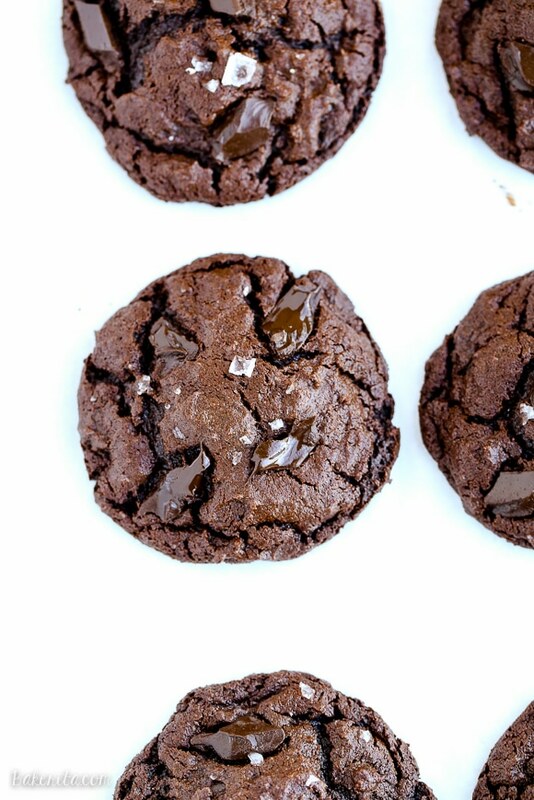 These brownie cookies look and sound amazing! I’m super jealous of you being in London! My husband lived in London for 2 years and talks about it all the time! These cookies look so tasty!! These cookies look incredibly yum! Have a great time in London and Happy New Year! I love it when gluten free cookies can look this delicious! How exciting that you’ve arrived! I just started following you on twitter. :) Can’t wait to see what you’re up to next! These cookies look so rich and delicious! You are going to have the best time in London. I did a semester in London many years ago :) Can’t wait to read about everything you do and see. I love that these are gluten-free – they sound so chocolatey and delicious! I’m super envious that you’re in London! I bet New Year’s Eve was tons of fun! Oh my goodness. These look amazing!! Yummmm!! Hi Rachel, these cookies look so delicious! Can’t believe they are gluten free – they look just like “normal” :) regular chocolate cookies! I’d love to make these – love everything chocolate! I want to devour these cookies, every single one! These cookies look delish! I love that they are gluten-free! Good luck with your semester in London! How exciting! These have been a big hit. I’ve made them at least 3 times already for various individuals and groups and made sure the ones who might “shudder” at the word “GF” in a recipe understand that the recipe doesn’t have any GF ingredients…just lacks flour. I tend to call them flour-less more than GF because of the label but whatever you call them…they are a BIG HIT and easy to make (and the recipe doubles well too!). I made them again this AM and got 101 (love that 1!) from a double batch to share with 3 different parties and will still have enough to share with a 4th party tomorrow. Win-win!! Thanks for a keeper recipe!! So glad that everyone loved them! They were a total hit in my family too – and they are so easy to make! Good to know that the recipe doubles well. Thanks for the comment! Sorry I’m late, but have so much fun in London! It’s definitely my favorite of all cities I’ve been in Europe…not sure why. These brownie cookies look amazing. What could be better than a brownie and cookie combined! I’m totally into these gluten-free chocolate cookies! Simple and decadent. I just baked a batch and they are amazing. They taste exactly like double chocolate chip cookies I get at Tim Horton’s, except gluten free and even better. I jokingly told my roommate I messed up the batch and hence I will be a good friend and eat them all haha. I have no idea how big your supposed to make these.I just took a easpoon and scooped up a blob. I think thats too much since one poster said she got 101 from a double recipe!! She must have made teeny tiny cookies! Im hoping my miuch larger blobs come out well.. I updated the recipe so that’s it’s more clear how big to make the cookies, but I hope yours turned out well! Thanks from trying them. I am a gluten-free newbie baker so maybe it’s just me, but I had no luck with these cookies. I made tablespoon sized balls but once it the oven they spread completely flat, turn a deep brown/almost black and aren’t even fully cooked. :( is there something I’m doing wrong?! I followed the receipe! Hi Amy. Since I’m not in the kitchen with you, I’m not sure exactly what went wrong! It sounds like your cookie dough may have been too thin if they spread so thin, but it’s odd that they didn’t even cook. To counteract them spreading, try refrigerating the dough for about an hour or until it’s thoroughly chilled before baking. I’m sorry I can’t be more help. Oh maaaan. The amount of fudge in these cookies is totally INSANE! I mean, I seriously just want these for breakfast. They look so thick, chewy, and dreamy, Rachel!! You had me at brownie cookies! These look so good! Love the thick texture. Wish I had a few of these for lunch! It’s the best!! I also did “Abroad Bites” posts where I shared pics and talked about what I did…and it’s all things I never would have remembered otherwise. I love having the records :) Thanks so much, Denise! Oh my goodness. I saw these cookies on your snapchat and just wanted to reach through the screen and eat one. So much fudgy chocolatey goodness! I realize your study abroad in London is now a gorgeous memory but man, I don’t know what I crave more – that trip or these cookies! No, I do know – these cookies! I can’t handle that melt-y chocolate-y goodness! Well done, my dear! This recipe looks great. I can’t wait to give it a try. Very nice site by the way! Oh I am glad you brought these forward! I need some chocolate cookies soon! 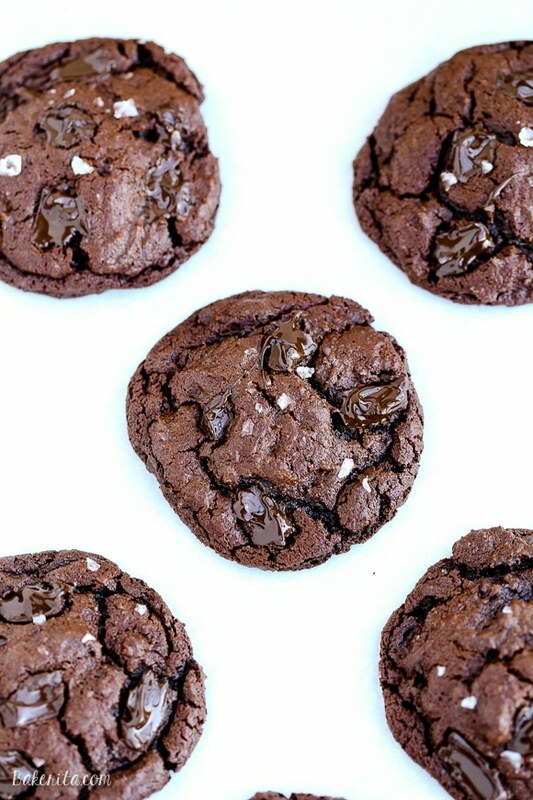 Your cookies always look so amazing, and sea salt and chocolate does something to me every time! I love that these are gluten-free too — pinned! You had me at chocolate and brownie and cookie! lol! Seriously, those three words are all I need to make me extremely happy :) Love this recipe and your new pics! I’m so glad you reposted these, they look amazing! So fudy and delicious! these are goooood. I made a half-batch b/c I knew I’d have trouble not eating too many! I posted it on Facebook as a hint to all my friends who worry about what to make for me; this is perfectly delicious without any strange ingredients or a background in GF baking. Thank you! these are goooood. I made a half-batch b/c I knew I’d have trouble not eating too many! I posted it on Facebook as a hint to all my friends who worry about what to make for me; this are perfectly delicious without any strange ingredients or a background in GF baking. Thank you! These cookies look amazing and I cannot wait to try them. I would prefer to make them non-dairy but I’m not interested in using margarine. Is there another fat that would work? Perhaps coconut oil? Or does the fat need to be solid in order to cream the sugar? Thanks for your help! Hi Roz! 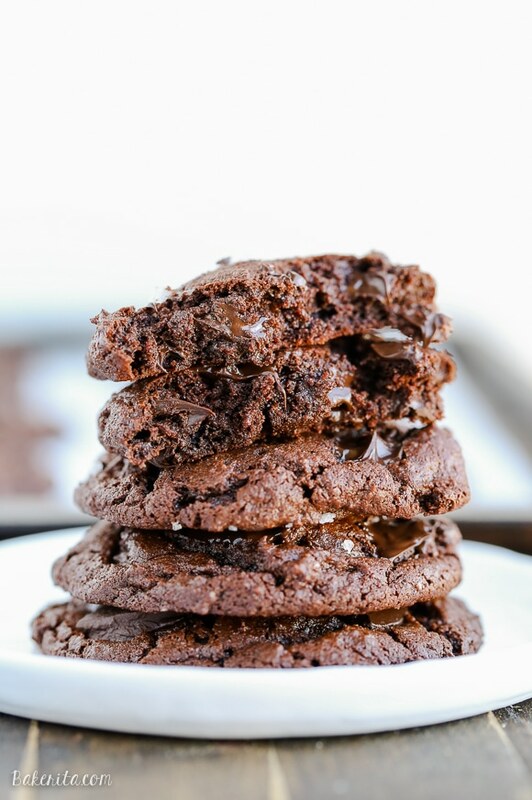 I’d recommend using this recipe instead: http://www.bakerita.com/paleo-double-chocolate-cookies/. It’s already dairy-free, made with coconut oil. You can use regular sugar in that recipe too if you don’t want to use coconut sugar. Hope this helps! So glad you enjoyed them, Carol! Your changes sound delicious – thanks so much for your feedback. So glad that you enjoyed the cookies, Lisa! Thanks for the feedback. Absolutely…hands down….my favorite, uber chocolate chip cookie recipe. You’re brilliant btw! ‍ They turn out perfect, easy to make. The only change is lately, I’m too cheap to buy vanilla, so I fine ground some coffee and add that instead. I’ve added nuts On occasion also. Lately I’ve been using Hershey’s Dark cocoa…. Delish! I’ve followed you for years and hope you’re baking for many more. I’m SO thrilled to hear you’re loving them! Love your sub of the coffee for the vanilla (it’s truly crazy how expensive vanilla has gotten). Thank you so much for your kind words and feedback, hope you find many other recipes you love! These are great! Very quick and easy and I love that there are no strange or hard to find ingredients. I didn’t have any chocolate chips so I added chopped almonds. Turned out really well, and I’m usually bad at baking. Thanks! So thrilled you’re enjoying them! :) Thanks for the feedback. So the taste of the cookies was perfect, but the cookies themselves turned out to be a disaster. I don’t know what I did wrong but I followed the recipe to a T and they were looking pretty liquidity so I decided to add some flour and thought that it was weird that the recipe didn’t call for that, but even after adding the flour the cookies turned out so flat and hard. Still taste amazing just flat. Hi Shelby, sorry you had trouble. Did you let the dough chill before baking? Adding unnecessary ingredients can also mess with the chemistry of a recipe as well, which could’ve caused the problems you encountered.